I have been crocheting for many years now and most of my creations have been inspired by Pop Culture characters or generic Amigurumi animals such as dogs and cats that I crocheted spontaneously or without preparation. Most of the time I didn’t know what the end result would look like. I was the queen of improvisation until I went to the DesignerCon convention last November. DesignerCon is an annual art and design convention that includes collectible toys, customs, plush, designer apparel and pop art of all kind. I was blown away by the talent and creativity of all the artists and it really inspired me to go beyond what I have been doing for the past few years. I decided to learn to draw characters and use my imagination to be more creative. I started with online beginner tutorials that helped me understand the basics and crocheted a doll based on the Manga Monster drawing tutorial I learned from artist Christopher Hart. Using a drawing I made from a tutorial was a good first practice. I have learned a lot in the process and even though I ended up with a few mistakes along the way I am very happy with my first try. I had no problem making the body but the real challenge came when I started crocheting the head. I was afraid to make it to small or too big. I ended up making it a little too narrow (if you look at the drawing, the face is a bit wider on the sides). It’s no big deal since it’s for practice, but I did learn that I shouldn’t be afraid to crochet on a larger scale! I named this little monster Olallieberry, which explains why its main color is purple (I picked the name before deciding on the colors). I added the blue and pink based on color combinations I found on google. I had a lot of fun doing this, and I intend to continue in that direction this year. 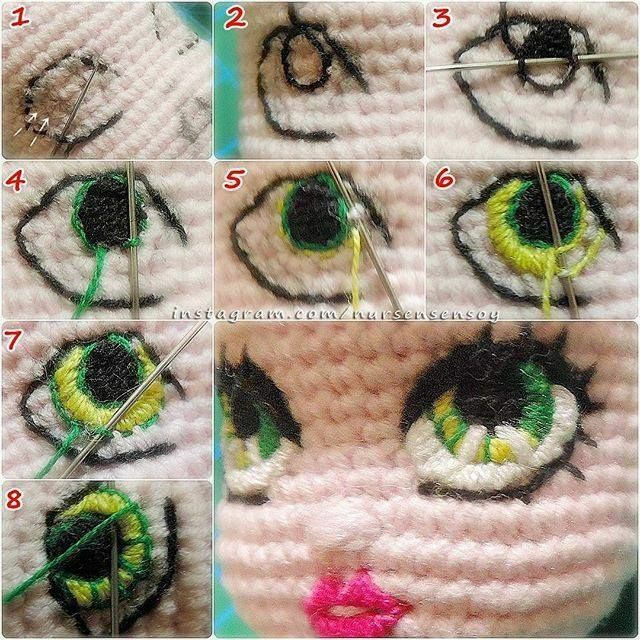 I hope to learn and improve my skills by doing this, and I can’t wait to make my second doll using this new process. I will still make Fan Art dolls because my love for Pop Culture will never fade, but I am going to focus more on my own creations because I really want to use my imagination and see what I can do. I can’t wait to start on my next one!! Stay tuned for the next episode (I can’t wait to show you what I have in mind). Two months ago I made a post about a panda bear pattern I had created for my ETSY shop, a cute little amigurumi crocheted with regular acrylic yarn. I enjoyed that project so much, I thought it would be fun to try a different version of the panda using the same pattern but with a type of yarn that would give it some fur. Both versions are cute, but the result is so different that it doesn’t look like it was made from the same pattern. the second version of the Panda, so fuzzy! The first version was made with Caron Simply Soft, which is labeled as a medium weight #4, and 100% acrylic. It is quite small for a yarn of that category, I usually end up with smaller plushes when I use Caron. You can really tell the difference in size. The first version of the panda is about 5.5 inch tall, the other one is 7 inch. I used the same 2.75mm crochet hook for both plushes without any alterations in the rounds, but the yarns I used for my second panda are thicker, hence the result. Big fuzzy panda and its little acrylic version. I used two different brands of yarn to crochet the fuzzy panda. I usually prefer to work with the same brand on one project when I need different colors but in this case I couldn’t find both in the same collection so I settled for Butter Cream Angel Air in black, and Yarn Bee Tender Touch in white. The black yarn is 50% Acrylic, 28% Nylon and 22% Wool. The white yarn is 100% acrylic but still has a fuzzy feel to it, which is what I needed to create fur. In order to create the fur, I gently brushed each parts of the panda with a pet brush before sewing the parts together. I think it is better to brush after the parts are stuffed with fiberfill, otherwise you might end up with stretched parts (it happened to me the first time I tried this method). Trying two versions from the same pattern was a fun experiment, and I cannot tell you which one I like best because I love both pandas. I hope you enjoyed this post and that it will inspire you to also try different type of yarns for your projects.